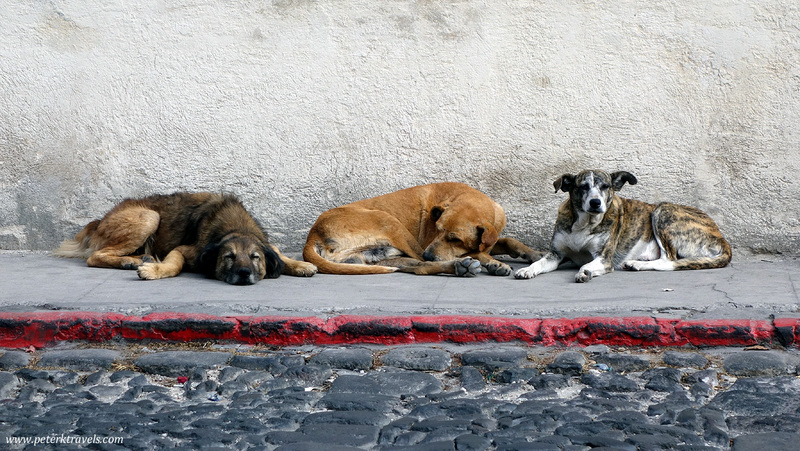 I was in Antigua, Guatemala last week. This was my third trip that city in the past few years — obviously, I am a fan. This particular trip didn’t go as planned due a bad case of food poisoning. 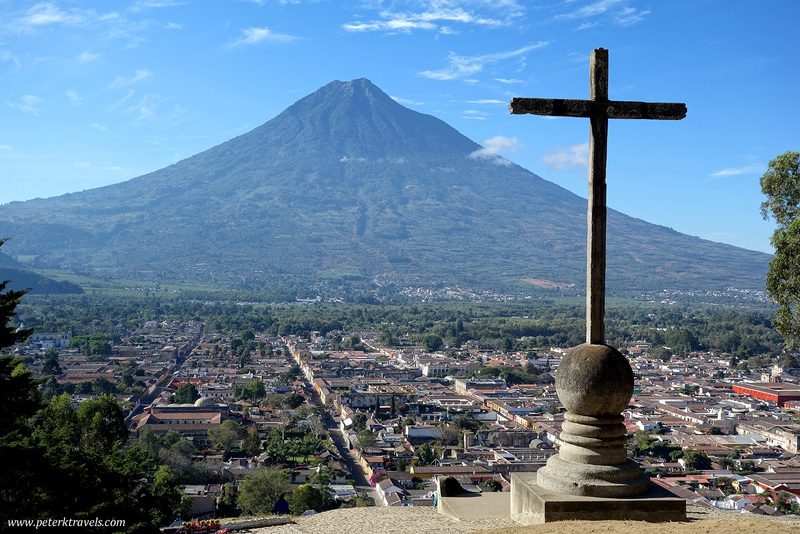 I had hoped to leave Antigua after a few days and visit Chichicastenango, but it wasn’t to be. I did have three nice days in Antigua before falling ill. I’ll be sharing some my photos from those days. Plus, I’m still working through a lot of other trips, so you’ll see some Mexico, Colombia, maybe even some from Ecuador in the upcoming weeks and months. The Arco de Santa Catalina is probably Antigua’s most-photographed landmark. The arch dates from the 17th century, and allowed nuns to pass across the street without going outdoors. It crosses 5th Avenida Norte, which is usually closed to vehicular traffic on weekends. For the best photos, try to be there on a Saturday or Sunday morning. There won’t be any cars parked on the street, and earlier in the day, you’ll have fewer other tourists around. 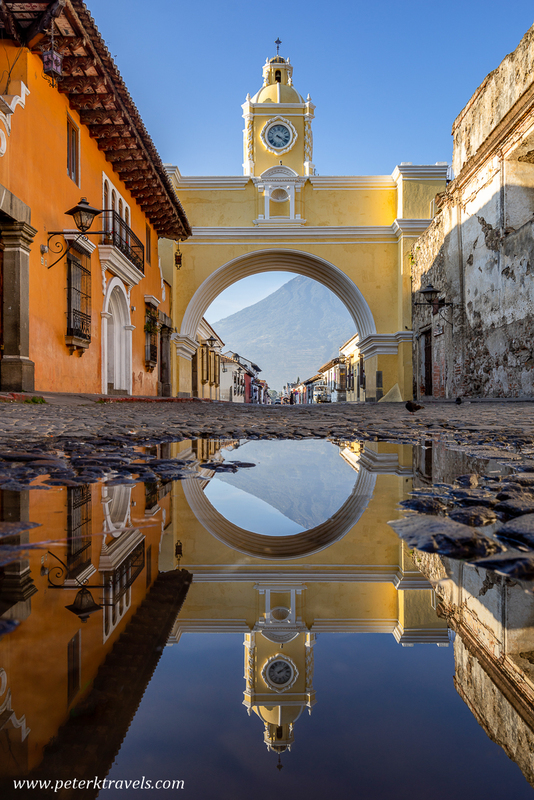 On a clear day, you can see the Volcano Agua looming behind the Arco. There’s usually some water on the street and it’s fun to play with the reflections. 4 Responses to "Reflections on Antigua"
I just got back from Antigua. That place gets into your heart. This photo of the Arco is absolutely STUNNING!!!!! Thank you for sharing it! I’ve also enjoyed looking at your other photos of Antigua and its surroundings. Grateful for the time you’ve put into sharing your thoughts and your photography. Thank you! I have an early morning (pre-dawn) shot of the Arco I need to post as well. You’re right, Antigua is a special place. I’m looking forward to checking out your other photos as well. Thank you for giving me the opportunity to “visit” Antigua this morning.